More and more knowledge-intensive services are embedded in industry with the increasing com-plexity of technological innovation. The set of service institutes and enterprises form the bipartite network around the activities of technological innovation. Based on the knowledge distance be-tween service institute and enterprise, the co-evolution model of knowledge diffusion and industrial bipartite network is constructed, and then some computing experiments have made to analyze the evolutionary process of the model. Some conclusions are obtained from the analysis. 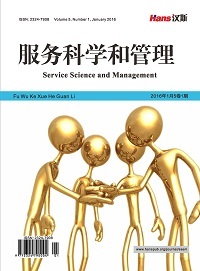 The adequate knowledge distance can improve the knowledge diffusion between service institutes and enterprises. Average knowledge stock in network increases with the increasing diffusion threshold. However, too high or too low link stickiness has disadvantage to the increasing of knowledge stock. The increasing rate of knowledge is very fast in the beginning, and then slows down to stable status in the end. The industrial network forms a small world automatically during evolution. The conclusions are very important for increasing knowledge diffusion and promoting innovation capability. 魏江, 马克•鲍登．知识密集型服务业与创新[M]. 北京: 科学出版社, 2004. 李守伟, 陈永泰, 司春林, 彭本红. 基于KIBS的企业技术创新能力形成与演化[J]. 系统管理学报, 2011, 20(4): 421-427. Szulanski, G. (2000) The Process of Knowledge Transfer: A Diachronic Analysis of Stickiness. Organizational Behavior and Human Deci-sion Processes, 82, 9-27. Argote, L. and Ingram, P. (2000) Knowledge Transfer: A Basis for Competitive Advantage in Firms. Organizational Behavior and Human Decision Processes, 82, 150-169. 周文, 陈伟, 朗益夫. 集群创新网络知识动态增长研究: 基于过程视角[J]. 系统工程学报, 2015, 30(4): 431-441. Phelps, C., Heidl, R. and Wadhwa, A. (2012) Knowledge, Networks, and Knowledge Networks: A Review and Research Agenda. Journal of Management, 38, 1115-1166. Hansen, M. (1999) The Search-Transfer Problem: The Role of Weak Ties in Sharing Knowledge across Organization Subunits. Administrative Science Quarterly, 44, 82-111. Reagans, R. and McEvily, B. (2003) Network Structure and Knowledge Transfer: The Effects of Cohesion and Range. Administrative Science Quarterly, 48, 240-267. 魏静, 等. 在线知识转移网络的复杂性扩散研究[J]. 管理评论, 2015, 27(7): 58-65. Yang, G., Hu, Z. and Liu, J. (2015) Knowledge Diffusion in the Collaboration Hyper Network. Physica A: Statistical Mechanics and Its Applications, 419, 429-436. Tang, X., Yang, C.C. and Song, M. (2013) Understanding the Evolution of Multiple Scientific Research Domains Using a Content and Network Approach. Journal of the American Society for Information Science and Technology, 64, 1065-1075. Ter Wal, A.L. (2014) The Dynamics of the Inventor Network in German Biotechnology: Geographic Proximity versus Triadic Closure. Journal of Economic Geography, 14, 589-620. Wang, S. and Groth, P. (2010) Measuring the Dynamic Bi-Directional Influence between Content and Social Networks. Proceedings of the Ninth International Semantic Web Conference, Shanghai. Roth, C. and Contet, J. (2010) Social and Semantic Coevolu-tion in Knowledge Networks. Social Networks, 32, 16-29. Iguez, G., Tague Martlnez, J., Kaski, K. and Barrio, R. (2012) Are Opinions Based on Science: Modelling Social Response to Scientific Facts. PLoS ONE, 7, 42122. Luo, S., Du, Y., Liu, P., Xuan, Z.G. and Wang, Y.Z. 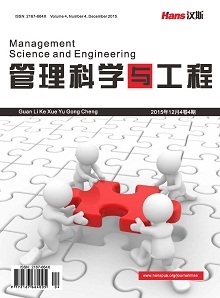 (2015) A Study on Co-Evolutionary Dynamics of Knowledge Diffusion and Social Network Structure. Expert Systems with Ap-plications, 42, 3619-3633. Mowery, D., Oxley, J. and Silverman, B. (1998) Technological Overlap and Inter-Firm Cooperation: Implications for the Resource-Based View of the firm. Research Policy, 27, 507-523.